A Smorgasbord of Genetics, Neurodevelopment, Psychiatry and Challenging Behaviours in people with Intellectual and Developmental Disabilities. This conference is designed for professionals from different sectors within the field of disability. 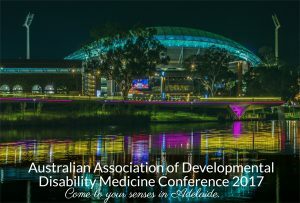 It is a must attend for general practitioners, paediatricians, adult and child psychiatrists, nurses, occupational therapists and educators who work with people who have intellectual/ developmental disability. Two world class key note speakers, Professor Jozef Getz and Professor Ted Brown will present latest research in the field of neurodevelopment and genetics. There will be Interactive case presentations, panel discussions and exploration of new ideas in the field of sensory processing. A strong clinical focus will ensure that what you learn today can be translated directly into your practice tomorrow, so come along and feast your senses in Adelaide! Jozef Gécz, PhD is an NH&MRC Senior Research Fellow and Professor of Human Genetics at the Adelaide Medical School. He discovered or contributed to the discovery of numerous genes for various forms of neurodevelopmental disabilities including cerebral palsy. He will present on the new genetic technologies which are transforming the diagnosis of neurodevelopmental disability. W. Ted Brown, MD, PhD, is the recently retired Director of the New York State Institute for Basic Research (IBR) in Developmental Disabilities, Staten Island, NY. (He recently moved to Sydney, married Dr Jacqueline Small, and is now a Visiting Professor at University of Sydney.) Much of his research has focused on the Fragile X syndrome, autism, and progeria. He was the first to describe a relationship between autism and the Fragile X syndrome. He will describe progress being made in these areas and new developments in genetics. Nicole Kyrkou: Program manager complex needs and mental health DECD. If you would like to know more about AADDM, please click here.